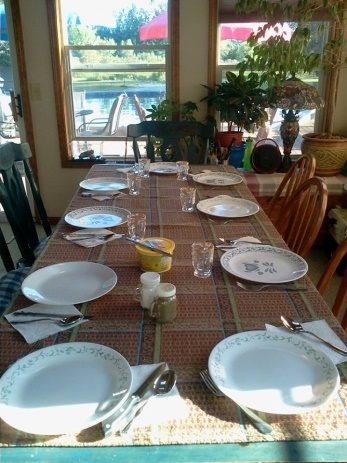 Have you ever been at a big family gathering when as you sit down to eat together there is an empty chair there? The loss of the one who is missing, for whatever the reason, leaves a sense of heaviness in the air and the sense of brokenness, or feel that the moment is not complete without the one missing whose presence would change the whole atmosphere. If only … if only they would walk through that door and take their place at the table with the family then all would be well, joyous and complete. Prayer has been a growing passion in my life over the past year few years and U4theU’s Global Prayercasts have been a little taste of heaven for me. I love my global family and I long for these moments and am thrilled at any opportunity to gather together with my family at our Father’s throne and talk with Him about those who are yet missing from the family gatherings and about our desire to fill those empty seats at His banquet table. As God’s children we have tasted and seen that the Lord is good, yet we cannot be complete or content while there are so many in this world who have yet to have one opportunity to hear the good news about Jesus and to embrace Him and the hope of salvation that came at such a great cost. God’s love for mankind and His desire to redeem us cost Him everything. King David once said, “I cannot offer that which cost me nothing”, how will we respond or to what extent will we go to bring even one more to His table with us? When He calls us home will we come alone or will we need to add chairs to His table for those we’ve invited to come home to the Father’s table? Does the thought of the empty chair at His table haunt you as it does me? I pray that each one of us will make the most of the God’s gracious gift of prayer for it is a great privilege and honor to meet with Him at His throne and to lift up those who are lost or yet unreached with such good news and petition Him to intervene on their behalf for their precious souls. Oh for that moment when yet one more will walk through that door and take their place at His banqueting table, then we and the angels will together rejoice as one less chair is left empty and one by one our brothers and sisters find their way home. Come, let us pray together…..